Former Los Angeles police Deputy Chief Bill Scott was sworn in Monday as San Francisco's new chief of police in a City Hall ceremony marked by the shouts of a handful of protesters. Scott, who was appointed by Mayor Ed Lee last month after a months-long search triggered by the resignation in May of former police Chief Greg Suhr, takes the helm at a time of turmoil and change and is expected to lead the department through a reform process started under his predecessor. He acknowledged today that the department has difficult challenges ahead. The department is working to implement a series of reforms recommended by a U.S. Department of Justice report released in October and also recently adopted body-worn cameras and finalized a revised use of force policy that has become the subject of litigation with the San Francisco Police Officers Association. "We have been tasked with reforming our department, not for the sake of change or for political purposes, but instead for the sake of making it better at what we do, that is keeping our city safe and free from disorder in a manner that is constitutional, effective, professional and legitimate in the eyes of the public, "Scott said. "You have already begun that process and I applaud you for your efforts," he said. Scott, whose selection over department insider candidates such as interim Chief Toney Chaplin prompted a negative reaction from the San Francisco Police Officers Association, said he had begun meeting with San Francisco officers and had been welcomed. He said he understood that the trust of his officers was not a given but would have to be "earned." It was as Scott spoke about the community's desire for reform that several protesters began shouting from the audience, calling out phrases including "Gascon do your job!" -- a reference to the slow pace of charging decisions in recent police shootings under District Attorney George Gascon. The protesters were quickly removed and Scott continued speaking through the interruption. Lee said he expected Scott, an Alabama native who has 27 years of experience in the Los Angeles Police Department including direct involvement in reform efforts there, to be "the finest police chief in America." 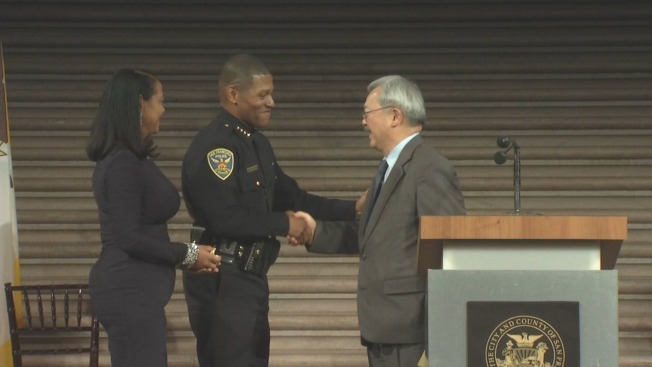 "The San Francisco Police Department strives to be a model for 21st century policing and a leader in our nation in balancing public safety and community trust," Lee said. "I am confident that the appointment of [Scott] as chief of police will be the next step on the path to improvement and reform."